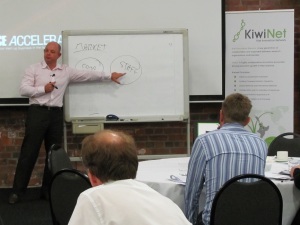 Market validation, before the really expensive part of idea commercialisation, was Duncan Ledwith’s message to KiwiNet people. What pain point do you address was his rhetoric question put to university and CRI commercialisation people at a recent Wellington forum? The Auckland Icehouse and UniServices executive in residence, ex-pat Scot and former Microsoft ideas to market man (as well as some of his own ideas and products) says the start point for any commercialisation is to answer who that person is [with the pain], and what problem do you solve for them? A draft value proposition – “what do you plan to do for the person who has the problem’ – can provide a quantum for the issue that is intended to be solved is next. From this, the $ value, market share and volumes can be estimated. Constructing the offer, with a ‘minimum viable product’ feature comes next says Ledwith. “At every stage, the intention is to fast fail,” he says. He also made the point that this market research come market validation part should take a maximum of 90 days. For some of the products and services he’s been involved with, this stage has taken four days! It was all good pragmatic (as you’d expect from a Scotsman) stuff. The end result of such a market process reduces the risk of any new product launch, and means the startup team can focus on executing a product launch, and a branding and marketing campaign to support the new product release. It also launches the sales phase with a set of pre-qualified leads! Original generation time 1.8359 seconds. Cache Loaded in: 0.0479 seconds.